Response card: Handmade silver-blue colored lokta paper. Response envelope: Matching milkweed recycled A2 size (4-3/8x5-3/4) with blue tamarind leaf paper envelope liner (you glue in the liners). Ocean and Sand Colored Wedding Invitation for a Beach or Green Wedding. DIY Square Invitation of handmade lokta paper from Nepal. Elegant silver-blue colored booklet of beautiful handmade lokta paper. Bound and tied with lengths of two-tone paper raffia. Very natural yet sophisticated. Invitation is book style - with two facing pages (like a book). Cover has an inside pocket for enclosures. Booklet is entirely tree free. 100% post consumer recycled paper envelope. Colors are silvery-blue and natural creamy beiges with milkweed envelopes. MORE PAPER FACTS: Lokta paper is made in Nepal, from the lokta bush, a renewable source. 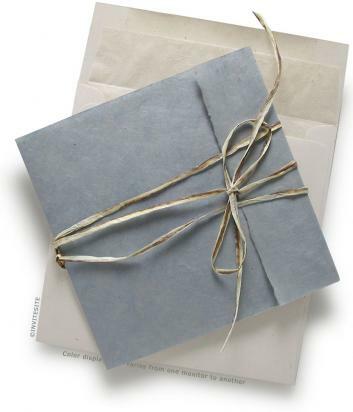 Envelopes are 100% postconsumer recycled paper made in the US, or in Canada. Invitation Sheet:Natural lokta sheet - measures 5-3/4"x 11-1/2" (two facing pages for copy). Envelope:Milkweed 70 lb square envelope - 100% post consumer recycled. Very handsome. Binding Raffia:Two-tone natural paper raffia. Envelope Liner:Cream-colored Mulberry tissue with pale yellow overtones - cut to size. Tools:Bone folder, glue sticks, 1/8th inch hole punch for binding. Microsoft Word templates for printing if you're print your own.